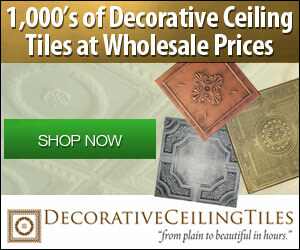 Welcome to the Affiliate Center for DecorativeCeilingTiles.net. Here you can reference the program’s terms and stay up on important updates. Decorative Ceiling Tiles is proud to offer the largest selection of decorative ceiling tiles, including faux tin ceiling tiles, glue up, commercial, drop ceiling tiles and anything else you need to conveniently and stylishly decorate your ceiling. We also carry backsplashes, crown molding and accessories. These tiles are also used for photography backdrops at weddings and events or anywhere else you need a nice looking accent wall. 1. We offer one of the largest selection of decorative ceiling tiles in the world. 2. We specialize in decorative ceiling tiles & have many helpful videos and articles. Visit our YouTube channel for more information. 3. We create custom designs & colors upon request. PPC Terms: Direct linking & TM bidding are prohibited.